Terem Quartet: Why the balalaikas? The members of the Terem Quartet can be described as cosmopolitans with a Russian soul. When they first performed at the Leningrad Music Teacher Training College in 1986, the musicians had a great success. A concert hall packed with an audience of thousands falls silent; the stage is barely lit. First, a domra begins playing gently, echoed by a button accordion. Then a second domra and a bass balalaika chime in. The audience recognizes the theme at once – the unmistakable tune that has been a hallmark of global music culture for years – “Besame Mucho.” The St. Petersburg ensemble Terem Quartet, known for its use of traditional Russian instruments, is performing the Mexican song at the opening of its 25th anniversary concert. The members of the Terem Quartet could be called cosmopolitans with a Russian soul. When they stepped on to the stage of the Leningrad Music Teacher Training College for their first performance in 1986, the audience would not let them go, giving them a standing ovation. At that time, the musicians promised they would make the group their life’s work. Such promises are easily broken, but the quartet has kept its word. The group’s members have always taken their work seriously. When considering what to call themselves, they thought for a long time before deciding that the idea of a terem expressed what they wanted to say. “Terem” is an older Russian word for palace, but it is broader than that, encompassing ideas of a place to live, a family home, and a place where all are welcome. But although the group plays Russian folk instruments and chose an old Russian word for its name, the group members wanted to be more than a caricature of Russian culture. One concept they hope to drill into their young charges is that playing music is a way to connect with people. On stage, the musicians create a welcoming atmosphere. They say that their main objective is to make the audience feel like family. They also want their audience to see that music is fun. “Humor and self-irony are an attitude towards the self that is intrinsic in Russian culture. This is what helps keep one sane when living under difficult conditions. Humor is the reverse of answers to serious questions. 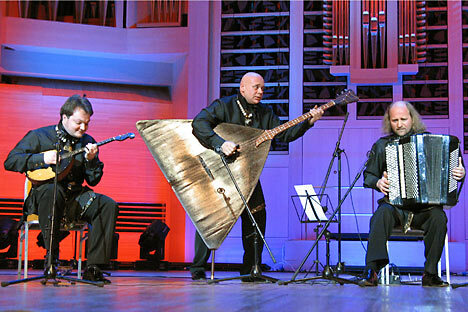 When King Lear asked his fool why Ursa Major was made of seven stars, the answer was, ‘because they are not eight.’ A musician’s task is to lead the listener towards answers to serious questions from a perspective that they don’t view as frightening,” said Andrei Smirnov (button accordion). The musicians have traveled extensively, appearing in more than 60 countries, performing over 3,000 concerts. They look at touring as a continuous string of new impressions from which inspiration is born. They are always perceptive of the culture of the country in which they tour and, as a rule, never leave without acquiring new songs. Yet in general the soul of the Terem Quartet belongs to Russia– and to St. Petersburg in particular.